Kilkenny CBS defeated Midleton CBS by 0-16 to 2-9 in the Masita GAA All Ireland Post Primary Schools Croke Cup (Senior A Hurling) Quarter-Final on Saturday March 10th at Clonmel Sportsfield. This entry was posted on Saturday, March 10th, 2018 at 12:00 am and is filed under events, News, Videos. You can follow any responses to this entry through the RSS 2.0 feed. Both comments and pings are currently closed. The Munster Scór Sinsear Final 2018 took place on Saturday March 10th at Cappamore. This entry was posted on Saturday, March 10th, 2018 at 12:00 am and is filed under events, News. You can follow any responses to this entry through the RSS 2.0 feed. Both comments and pings are currently closed. Limerick defeated Waterford by 2-10 to 2-9 in Round 5 of the Allianz Football League Division 4 on Saturday March 10th at Martinstown, Limerick. P.S. Chorcha Dhuibhne defeated Tralee CBS by 2-13 to 1-10 in the Corn Ui Mhuiri Football Final on Saturday March 10th at Fitzgerald Stadium Killarney. With Aodhán having worn the number two shirt on the afternoon of the Russell Cup final when he sustained what proved a fatal head injury, the Dingle school retired that jersey for this fixture. Winning captain Franz Sauerland referenced Aodhán in his acceptance speech, as did Dingle manager Éamonn Fitzmaurice. 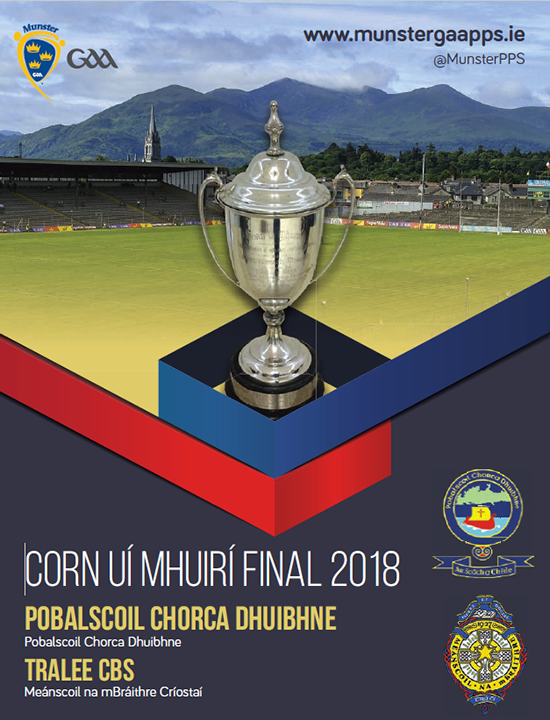 Scorers for Pobalscoil Chorca Dhuibhne: R Ó Beaglaoich (0-6, 0-4 frees); F Sauerland, C Ó Failbhe (1-0 each); D Uosis (0-3, 0-2 frees); D Ó Géibheannaigh (0-2); J Ághas, C Firtéar (0-1 each). Scorers for Tralee CBS: M Kelleher (0-3, 0-2 frees); F O’Brien (1-0); S Quilter (0-1 ‘45), D Regan (0-2 each); D Fitzmaurice, D Goggin, J Mortimer (0-1 each). POBALSCOIL CHORCA DHUIBHNE: E Ó Brosnacháin (Daingean Uí Chúis); C Ó Flannúra (Daingean Uí Chúis), T Ó Dubháin (Daingean Uí Chúis), Colin Ó Muircheartaigh (Daingean Uí Chúis); P Ó Cathalláin (An Ghaeltacht), G Ó Leidhinn (Abha na Scáil), Colm Ó Mhuircheartaigh (Abha na Scáil); F Sauerland (An Ghaeltacht), J Ághas (Abha na Scáil); N Ó Géibheannaigh (Daingean Uí Chúis), C Ó Failbhe (Abha na Scáil), C Firtéar (Abha na Scáil); D Ó Geibheannaigh (Daingean Uí Chúis), D Uosis (Daingean Uí Chúis), R Ó Beaglaoich (An Ghaeltacht). Subs: S Óg O Móráin (Daingean Uí Chúis) for Firtéar (58); A Ó Dubháin (An Ghaeltacht) for Ó Failbhe (59). TRALEE CBS: D Burns (Na Gaeil); P White (John Mitchels), T Brick (Ballymacelligott), D Bourke (Na Gaeil); J Walsh (Knocknagoshel), S Hamilton (Churchill), J Myers (John Mitchels); S Quilter (Austin Stacks), D Fitzmaurice (Austin Stacks); D Goggin (Na Gaeil), D Regan (Ballymacelligott), M Scanlon (Castlegregory); F O’Brien (St Pats Blennerville), J Lenihan (Churchill), M Kelleher (John Mitchels). Subs: E Carroll (Austin Stacks) for White (bc, 32); D Keane (Ballymacelligott) for Lenihan (38); J Mortimer (Churchill) for Regan (52); D O’Rourke (Austin Stacks) for Goggin (58); K Williams (John Mitchels) for Hamilton (60). In the event of a draw the Replay will be scheduled for the W/E 18th March 2018. Pick up a copy of Saturday’s 36 page souvenir match programme for 3 euro.